Fife Flyers head coach Todd Dutiaume hopes his players will take a lift from the response they got from the fans following their performance against Glasgow Clan on Saturday. Flyers fought hard to claim a dramatic overtime win which resulted in a terrific atmosphere following the match as players and supporters celebrated in unison. It was the team’s first victory at Fife Ice Arena since January 2, and their first over Clan since September 8, and Dutiaume admitted it was much-needed. “What you saw after game was happy hockey players and happy crowd,” Dutiaume said. “It’s something that everybody has really wanted for a while now. “I’ve always said how important the interaction between the crowd and the team is, and how much of a strength it can be for us. “Winning and losing either way can become contagious and either can become easy after a while. The victory keeps Flyers in fifth place in the EIHL standings but with four teams below them all tied together just three points behind, there is no margin for error going forward in the race for a play-off place. “Instead of being ultra-focused on where we’re sitting in the pack, it’s important to focus on the process that led to that win,” Dutiaume said. “It really comes down to work ethic because there were no significant changes to our game plan, other than demanding these guys play at the top of the their game, and find a way to win at all costs. “That being said, it’s important to recognise that the teams around us are playing very similar hockey to that, and the rest of the way in is going to be play-off type hockey. “It will be hard fought and competitive as you can see by the scorelines coming through. Flyers conceded just four goals over the weekend – a significant improvement on recent times – which Dutiaume put down to better puck management. “It’s team-defence and it starts with us holding the puck in our hands,” he said. “When we make smart decisions with the puck we seem to be fine as a team. “When we make plays that are low percentage and not really in our play book that’s where we get ourselves in a bit of bother. 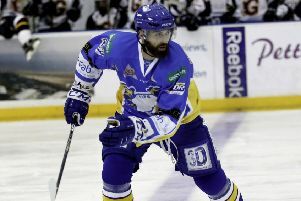 Dutiaume is now preparing his men for a one-game weekend with Manchester Storm, one of the team’s in hot pursuit, visiting Kirkcaldy on Sunday. “Manchester are another team seeing a resurgance of form,” he said.